Alternative building is the wave of the future, if not already the present. It is possible to build in multitudes of ways, with materials of the Earth, materials that can be recycled, and materials that are plentiful on the Earth. Passive solar is exactly how it sounds, passive. This technique is simply having sunlight exposure in the house with sky lights, windows facing the sun, and warming up the floors and walls literally only with sunlight. The places below where there are links, click on these to see more information about this alternative building system we are building. Alternative building is the wave of the future, if not already the present. 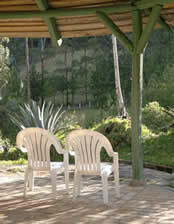 Gaia Sagrada is an Eco Friendly Community and village. It is possible to build in multitudes of ways, with materials of the earth, materials that can be recycled, and materials that are plentiful on the Earth. Right now, Gaia Sagrada has buildings made of cement, cinder block, rocks and wood. 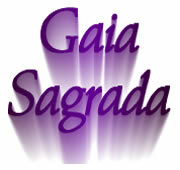 However, as Gaia Sagrada grows and expands, the plan is to build various kinds of alternative houses in order to display and experiment with different types of structures, systems and methods. Gaia Sagrada acts as an example to the Ecuadorian community so that the Ecuadorians can be inspired to do such things themselves. By example, we plan to teach the world around us that they too can have wonderful houses and living situations for low cost materials and literally get free hot water and heat. Everyone can get free hot water from the sun with a few black tubes on the roof, capture rain water with gutters and tanks, filter it with bio-sand filters they can construct themselves, and reuse shower water in the toilets so that they aren't using potable water, which is such a waste! Bio-sand filtered greywater in toilets is more reasonable use of water in toilets. That way it gets used twice before it goes to the septic. At various times of the year, we have open houses for the Ecuadorian community members who are interested in learning how to build these alternative types of houses, copy our free water and solar systems, and join us in the conservation of Earth's resources by leaving a gentle footprint. 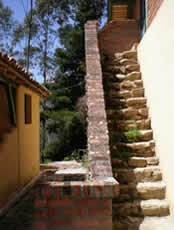 Adobe is a long known and ancient method of alternative building. 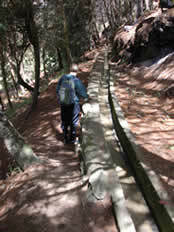 It is simply dirt and other materials mixed together and put onto a grid of bamboo or small wooden interwoven sticks. 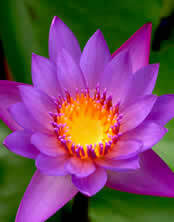 This method has been used all around the world for centuries, if not more, by all cultures on every continent. 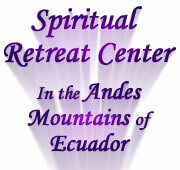 South America is no exception and we would like to fully explore this wonderful way of building. Straw Bale houses are warm, efficient, and inexpensive to build. They leave little impact on the Earth since not much wood is used, therefore not many trees are cut. These houses use bales of straw inside the walls, which creates wonderful insulating thick walls that stay warm in the winter and cool in the summer. One that we are really looking forward to is the bottle house technique. These houses are made with bottles embedded in cement walls, and the light from outside shines through, making a very pretty house indeed! Imagine walls of green or blue bottles with the afternoon sunlight coming through. Surprisingly, these houses are quite sturdy, more than you would imagine. The corn cob house is a unique and easy house to build. These would be little cabins, instead of houses. These are made with corn cobs in the walls, using either adobe or cement, depending on the builder. These too are quite comfortable. They hold the heat in the winter or keep the room cool in the summer. Passive solar is exactly how it sounds, passive. This technique is simply having sunlight exposure in the house with sky lights, windows facing the sun, and warming up the floors and walls literally only with sunlight. This full day exposure causes the floors or walls that are exposed to sunlight all day to hold a good amount of heat that continues to radiate into the air during the night. This passive solar concept will be used in a lot of future structures in order to create floor generated heat for the cool evenings. Right now, plans are in the works for creating showers with solar hot water simply with black tubes under glass on the roof of the shower house. We have gas heat showers right now, but we would like to get further off the grid as time goes on. Why not have perfectly free hot water and show the community around us how to do this too? It is easy, cheap, and lasts forever (almost)! We'll see how many years the tubes can last. It is quite easy to create solar heat with dryer duct sized tubing. It works exactly the same as solar hot water, but with air instead. The tubes are bigger, painted black, put under glass with full sun on it, and connected to the house with two holes, intake and output, with a small bathroom fan on one end. The intake hole is low and close to the floor for pulling cool air from the lower part of the room, and a little bathroom size fan, or even 12 volt fan hooked to a battery, is connected for pulling the air into the duct. The air then moves slowly through the duct system outside, exposed to the sun, and returns to the room through an input hole, simply putting the warmed up air into the room. This is an ingenious method that really works, even in -15 degree weather! All it takes is the sun warming up the black tubing underneath glass, and it works like a charm! There is a plentiful resource of clean water here, and it comes from the sky. We have clean water on the ground too, but why not collect the rainwater that falls from the sky for an hour or so every other day here, which keeps Ecuador so green. In just one rain, the water that comes off the roof of a mid sized building could fill a tank with all the water a person could use for days, including taking showers. How to capture this water? It's easy! Just put rain gutters on the downside of any roof, and you have an instant cistern effect, capturing clean water right from the sky. Rain gutters are not expensive, they last a long time, and it makes no impact on the Earth whatsoever. No drilling wells or re-routing rivers or streams toward cities. Note: It is illegal in several states in the USA to collect rainwater off your house. Here in Ecuador, no such laws exist. Some argue that it messes up the water table, but that is highly suspect. How can collecting rainwater in one tiny spot compared to all the open land where the water falls freely, have an impact on the water table? This is quite far fetched. What we really think it's about is so that people will still have to pay a water bill. After all, the water gets pulled out of the water table and put through your faucet anyway, so there is no difference. In fact, if you grab the water before it goes into the ground, you can bypass all the energy pollution and technology of getting the water back up out of the ground into your faucet. It is a much wiser choice to just grab it from the sky as it comes down, which takes no energy, clean it with a bio-sand filter which takes no energy, and let gravity continue to take it down into the ground which takes no energy, and it all equals the water still getting into the water table. You just use if first before it travels for the next 30 years down to the water table. The earth operates like a giant sand filter and cleans the water on its way down. No matter how you slice it, definitely a wiser choice than spending all that energy to pull water back up again. Water is freely circulating on this planet, and we can step into harmony with the way water is circulating on the planet, stepping in line with how it works rather than working against it and doing things the hard way, like pumping water out of the ground. It's already circulated and the faucet is on (rain) above your head in the sky! Bio Sand Filters are an incredibly simple, cheap, and effective method for cleaning water and making it drinkable. All it takes is a container with sand, carbon and gravel to make a bio sand filter. The water is put in through the top part of the barrel and by the time it travels out the bottom, it is drinkable clean water. We are using bio sand filters for cleaning rainwater, we can have an endless supply of clean shower water, drinkable water, and irrigation water with this easy and inexpensive natural method and all these roofs around to catch the water! 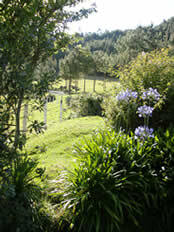 We mention permaculture and sustainable farming here because it is an integral part of building. Permaculture is a thoughtful use of the land in order to make the best use of water drainage, features of the land and organization. 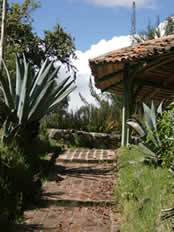 Even strategically placed buildings and structures can serve the permaculture process. It is all interconnected. Leave gentle footprints on the Earth, and take care of your Mother! There is a plentiful resource of clean water here, and it comes from the sky.